BMW i8 is a PHEV(Plug-in hybrid electric vehicle) and the first sports car with emission value in the range of compact vehicles. Plug-in hybrid vehicle consists of an electric motor and internal combustion engine. The electric motor in the i8 can generate 96 KW (131 bhp) and internal combustion engine generates 170 kw (231 bhp) of power with 320Nm of torque. The torque is combined of electric as well as engine. I8 can reach from 0 to 100 with in 4.4 seconds. BMW i8 can reach a top speed of 120 km/h with only electric motor running and 250 km/h with both electric as well as internal combustion engine in action. BMW i8 consists of several unique features which starting from its unique furturistic aerodynamic design, BMW eDrive Technology, 3 cylinder with Life Drive architecture with specific BMW I ensure driving experience. I8 front design is extremely low and wide, spectacular scissor doors, LED light design with laser lights(Optional). In interior user will get 2 large easy view display and driver centric instrument cluster. 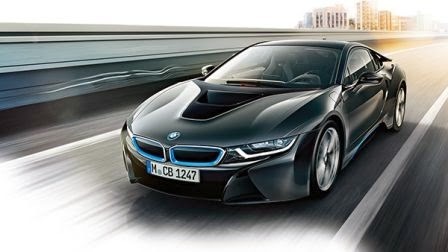 The i8 plug-in-hybrid-electric-vehicle can be quickly charged to 80% within 2.5 hrs using regular external power source. When vehicle is in drive mode BMW’s TwinPower turbo can charge the high voltage battery via generator and the battery also gets charged when brakes are applied. Using the brakes to charge the battery is a phenomena known as regeneration braking charge, thus due to this most of the time battery in the vehicle would remain charged enough and electric drive will always be functional.